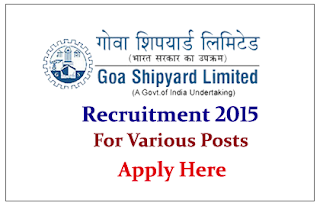 Goa Shipyard Limited is recruiting for the post of DGM, SM, Manager, Asst. Manager, and Management Trainee. Interested and Eligible candidate can apply online on or before 25th July 2015. 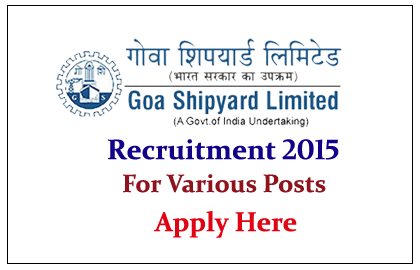 Company Profile: Goa Shipyard Limited (GSL) is one of India's leading shipyards. It is located on the West Coast of India at Vasco da Gama, Goa. It was established in 1957, originally by the Government of the Portuguese India as the Estaleiros Navais de Goa , to build barges to be used in Goa's growing mining industry, which took off after the establishment of India's blockade of Goa in 1955. How to Apply: Interested and eligible candidate can apply online on or before 25.07.2015. For more details kindly check official notification.